If you want to install some applications on your Apple TV 4 or you are looking for a jailbreak, you don’t have to do any complex job. Jailbreaking allows an Apple TV to run with some other software applications that Apple doesn’t allow officially. The reason is that when you purchase an Apple TV, it comes with built-in software restrictions that do not allow you to do anything with your TV. However, if you want to jailbreak Apple TV 4 using liberTV and Cydia Impactor, have a look at the process mentioned below. 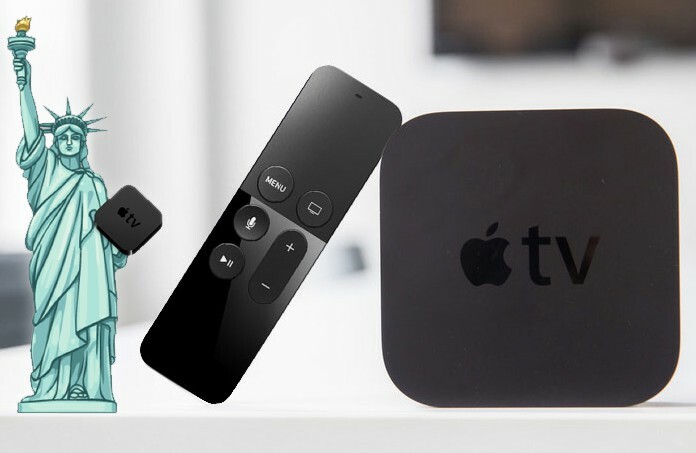 Before jailbreaking your Apple TV 4 and installing any software on it, you must know the pros and cons of it, and you must also be aware of the terms and conditions of jailbreaking. Apple has not announced jailbreaking legal or not legal in some countries. That’s why if you are in a country and don’t know about its terms, you can do it without any problem. Simply follow the process of jailbreaking. This process requires some necessary stuff to perform proper jailbreaking that is mentioned below. Apple TV 4 with tvOS 10.1, 10.0 to 9.1. A computer running Windows 10/8/7, Linux or Mac OS. The liberTV app to jailbreak Apple TV 4. A USB cable to connect the devices. 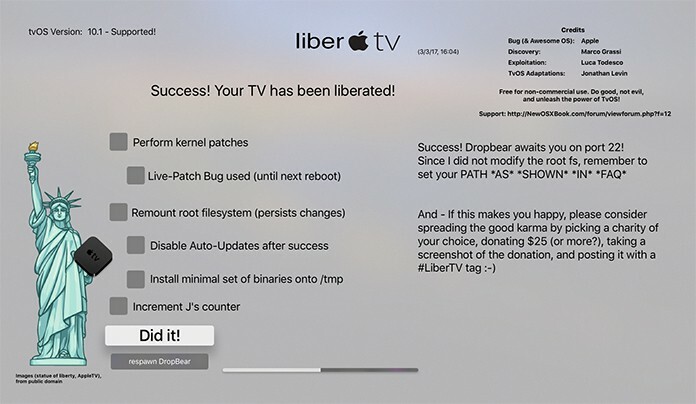 After gathering all of the stuff stated above, you can easily perform a proper jailbreak to install the liberTV app on your Apple TV 4. Make sure your Mac has the newest version of iTunes on it. If you don’t own the advanced version, you can download it from Apple website. Now come to the complete process of jailbreaking. Step 1: First of all, grab your USB-C and connect your Apple TV 4 to the Computer. Step 2: Download liberTV app from our website. Step 3: Now you will have to download Cydia Impactor app for your computer. It doesn’t matter which system you are using; you can download it for either windows or mac. Step 4: After doing it, you are ready to do the next steps. After downloading the Cydia Impactor, you will have a file named liberTV.ipa on your computer. It is the necessary file to do the next steps. Step 5: After connecting your Apple TV to your computer, the Impactor will show that your device is connected to it. Click and drag the liberTV.ipa file to the Impactor. Step 6: After dragging the file to the impactor click on the start button to start the process. Step 7: Now you have to put your apple id and password in it for id authentication. Step 8: Once the impactor pushes the jailbreak app to your Apple TV 4, disconnect the USB cable from your computer. Step 9: Now the liberTV app is live on your TV, and it should be there on your apple TV. 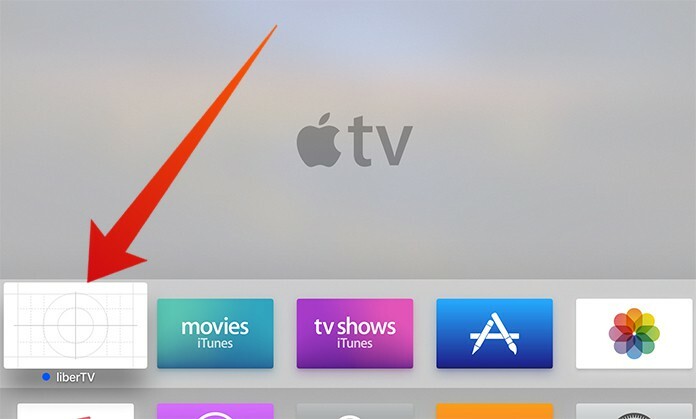 You will see liberTV app installed on your Apple TV. Open it! Step 10: Now it’s time to start the Apple TV 4 jailbreak procedure. You will have to select the options you are going to do to perform the jailbreak. Step 11: After selecting the required options, click on Do it! Step 12: Now your apple TV is successfully jailbroken. The system will report that your apple TV has successfully jailbroken and now you are ready to do your willing stuff on your Apple TV. If the jailbreak fails and your TV reboots while processing the jailbreak, repeat this process and it will hopefully jailbreak your Apple TV.